In 2010, Bare Hands, Inc. initiated a community outreach art program with the YWCA of Central Alabama in conjunction with the Birmingham Biennial Exhibition at Bare Hands . This exhibit focused on the role that race plays in our culture. As the YWCA's mission includes the powerful pledge to "eliminate racism," the collaboration was a perfect fit. By the end of the first session of classes, taught by Julie Watters, it was clear that this program was something Bare Hands wanted to foster in the years ahead. 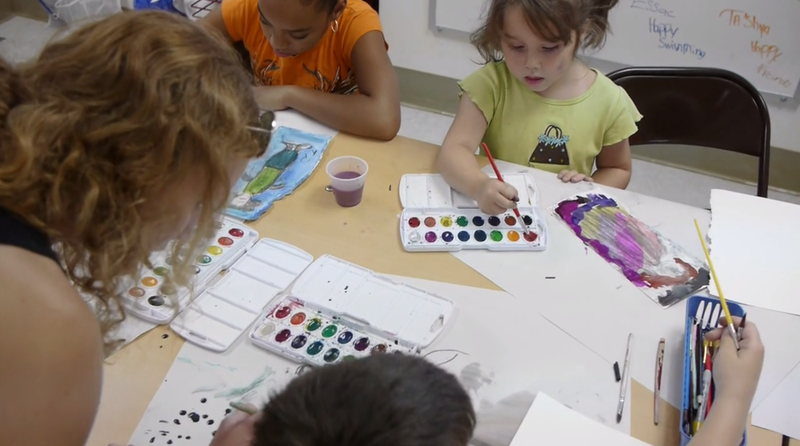 Working with the teaching artist, Bare Hands set a goal to extend love for and knowledge of art to the children of the YWCA’s summer transitional housing program, while actively pursuing a way to engage area artists. Since then, the program has grown, adapting to the unique challenges of the children’s circumstances and aligning with the YWCA principles. Despite limited resources, response from community artists has been overwhelmingly positive. Professionals in various mediums have come forward to teach their strengths, and the program survives thanks to the generosity of local artists and financial support from the Día de los Muertos festival. The curriculum has grown from that modest one-teacher setting to a three session series, with workshops including painting, drawing, clay, fashion, enviroscape, audio-visual and a marketplace.